In Mao Zedong’s 1937 essay “On Contradiction” he further examines the theories of Marx and Lenin around dialectical materialism and the idea of the contradictions that, for Marx, provided the impetus for further human evolution but for Mao, became the basis of all human existence. For Mao, and proponents of Maoism, we live in an inner and a universal world that is based on perpetual contradiction and constant transformation. The contradiction becomes something very important for Maoists, not only for them to understand and locate the complexities of ruling over a people, but also for the inner world of a person themselves. It is the theory of the contradiction that gives them some capacity for understanding the destructive (and constructive) behaviors of others, and then in themselves and in their own personal histories. It is the notion of the contradiction that underpins Justin Fleming’s beautiful play, His Mother’s Voice, and it is Fleming’s recognition and formation of the contradiction that gives His Mother’s Voice the broadness of scope and spirit of inclusion it manages to find, even as a white Australian male is writing about a Chinese mother who lost her husband to the Chinese cultural revolution. It was the spirit of the contradiction that allowed for both the start of the Chinese cultural revolution and its demise. It existed from 1966 through to 1976 and was intended to encourage the Chinese to refuse Western cultural pursuits in favour of Chinese cultural pursuits. This is a common practise in itself, we have been nonchalantly noticing the unwavering approach of the French to do the same across the world, a force one could argue is very successful. Many countries include special programs to invite bi-linguists to come and translate their great works of literature so those works can enter worlds otherwise closed off and mini cultural revolutions such as the deliberate encouragement of Scandinavian art house cinema due to grants and legislation when Sweden, Denmark and Norway recognised they’d never compete with American films on budgeting and popularity, but they could compete in the realm of genius. These are just a few examples of erstwhile politicians having a vision of some sort of cultural global imposition on the world that they could affect politically. In our own country, one could make the argument that the growth of our boutique wine industry was due to a Keating driven legislation. An entire industry and reputation was born from a particular person, in a particular time having a combination of vision and power to be able to make something happen. So Mao wasn’t out of line in wanting the Chinese to concentrate their efforts on their “in-house” cultural activities. Where everything fell apart was Mao’s instance that the bourgeoisie were revisionists, attempting to restore Capitalism, and that they’re influence needed to be eradicated through class struggle. This was not intended to be the death sentence it became, and eventually communist China sought to reconcile with the artists it so poorly treated for a decade. As Justin Fleming stated in his wonderful interview with me (here – its long, but it’s well worth the read) The Chinese are not the first to perform anti-humanitarian acts, then justify them, and then try to find a way to mend the errors, but they do expect to be treated with the same respect when forging a path of reconciliation afforded any other country. And here lies the most obvious contradiction in Fleming’s play. What do we do with our crimes? How to we mend the broken hearts we have caused? When errors of judgement like this are forged, then brought to light, how do we find a path back into the heart we so easily hurt under different circumstances? These are issues we all face in our lives, and China, in its path to reconciliation with its bruised and battered artists, needs to do this while including the face-saving bravado inherent in all diplomacy. Fleming pits this contradiction against the individual story, overheard on the radio one day, of a young man whose mother had such a passion for her craft, that she painted a piano onto the top of the kitchen table and sang the notes to her son as he performed his subversive daily practice in secret. 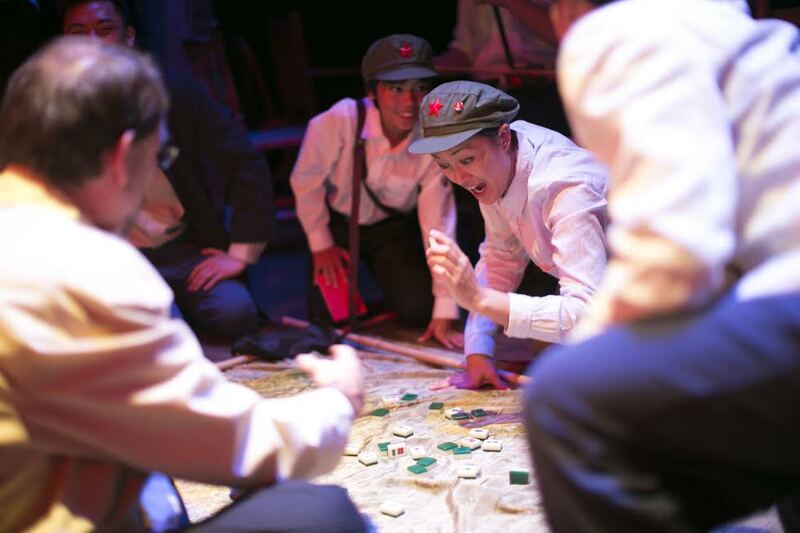 Without giving away too much of the play, this incredible act of artistic courage and generosity was performed under the most dangerous circumstances, this little family having lost their husband and father to the revolution. What propels a woman to take such a risk for art? Why is it so important that her son learn to play the piano that she will risk her life for it? How does one teach the piano – an instrument that takes years of dedication and practice, under such conditions so that the student becomes one of the worlds great concert pianists? These are the inner contradictions of an incredible woman, who insisted on her reality being forged against the truth of her circumstances, and stood up against an entire nation in her determination to do it. All of this enormity is brought to thrilling life in the current Bakehouse Theatre Company production of His Mothers Voice under the dedicated and intricate direction of Suzanne Millar. With great skill, she weaves a small cast to represent with clarity and integrity an enormous nation, bringing that size and scope to the smallness of a stage. At the centre of the cast is the magnificent Renee Lim as Yang Jia, who includes an overwhelming presence in the role of Qian’s mother, not to mention great tears to my eyes in her final scene. She has a lovely voice, and commanding skill in fully embodying her character, but it is her stage presence that wins over the idea of the woman struggling in secret against a nation. 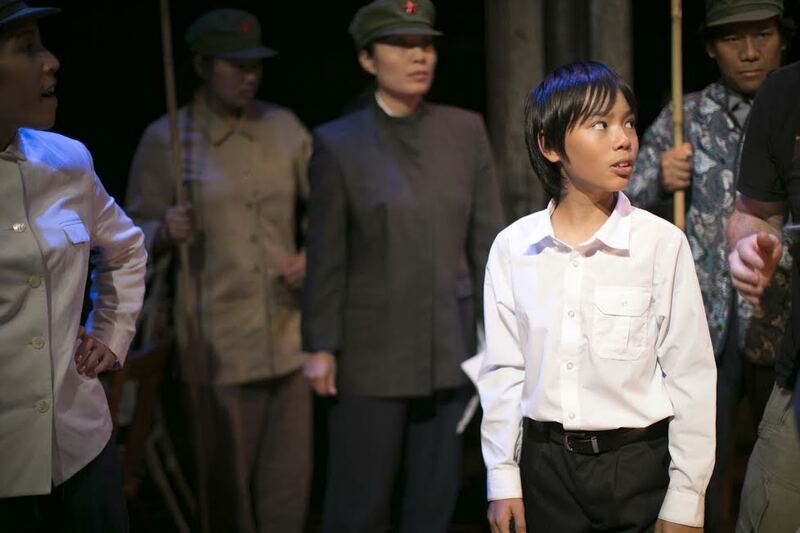 Harry Tseng plays a grown Qian Liu, a complex role that includes singing, and piano performance. 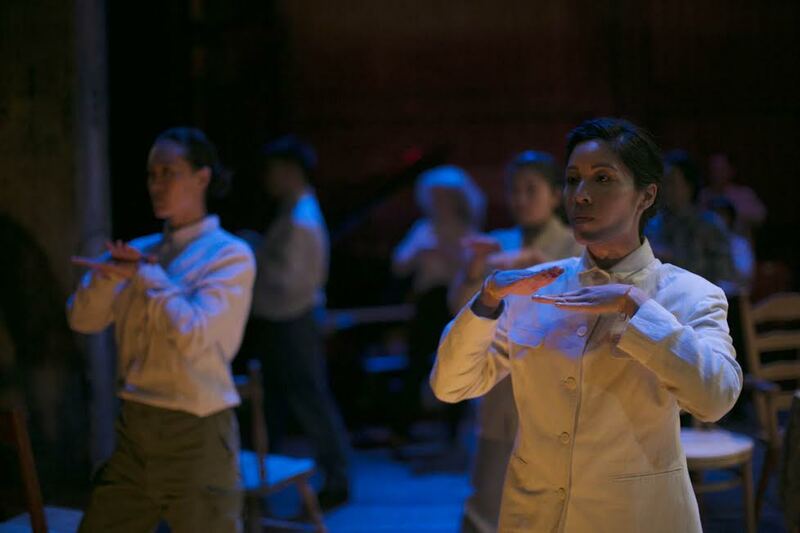 Suzanne Millar moves Qian around the music that fills the room, rather than the stage, so that he seems like a conduit between the “really real” and the sweeping sounds that constantly fill our ears. This is a play about music at its core, and Millar, along with sound designer James Colla bring the two musical worlds together in a synthesis that underscores the prophetic beliefs of Yang Jia, making the sounds partners in the joyful expression and beauty of art. None of this scope and ambition would be possible without the best of the best performing the many other roles that go into making a cast a nation. The energy and exuberance each cast member brings to the room and the performance invigorates the scope of the play. As Millar moves her cast around with vitality and fluidity, using chairs and flags in enormous march style dances to depict the revolution, the audience is swept up into an ocean of people, reminding us all of Ai Weiwei’s sunflower seeds. It’s a beautiful thing to watch, a perfect example of a director in tune with a writers vision, and a dedicated cast, perfectly on point to deliver on that expectation. His Mothers Voice is now showing at the ATYP theatre. You can Purchase tickets here.